Purpose. Sevoflurane and isoflurane have been reported to exert protective effects against ischemia-reperfusion injury (IRI) in various organs. 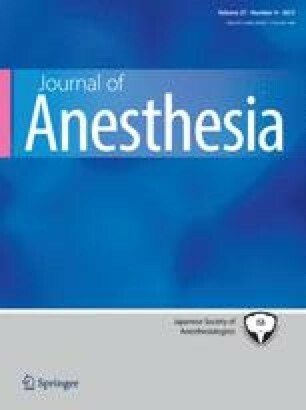 To compare the effect of sevoflurane anesthesia on liver IRI with that of isoflurane anesthesia, we performed the present study in pigs. Methods. Nineteen pigs were assigned to either the sevoflurane (n = 9) or the isoflurane group (n = 10). Hepatic warm ischemia was produced by 30-min hepatic artery and portal vein clamping beginning 90 min after the start of the inhalation anesthesia; this was followed by a 240-min reperfusion. To extend our evaluation, we evaluated the degree of IRI using various parameters (plasma α-glutathione-S-transferase [α-GST], lipid peroxide, and lactate concentrations), in addition to the conventionally used liver damage markers. Results. The lactate level was significantly higher under isoflurane than under sevoflurane at 120 min after reperfusion (4.0 ± 0.4 mmol·l−1vs 2.5 ± 0.3 mmol·l−1; P < 0.05). How-ever, this difference had disappeared after 240 min of reperfusion. No significant differences between the two groups were observed in values for α-GST, lipid peroxides, aspartate aminotransferase, alanine aminotransferase, or lactic dehydrogenase. Conclusion. The extent of the hepatic IRI seen under sevoflurane anesthesia in pigs did not differ significantly from that seen under isoflurane, as judged from measurements of a number of parameters over a 240-min reperfusion period.